Anyone driving through Texas from the west, especially along Route 66, has seen the signs: "Free 72 oz. Steak," they say. It's not quite that cut and dried, but it still encourages people to stop in Amarillo, a Texas town that is home to fewer than 200,000 people but produces 30 percent of the nation's beef, thanks to its cluster of ranches and feedlots. Should anyone doubt that Amarillo is a beef town: this is the city where Texas cattlemen sued Oprah Winfrey in the 1990s for airing a critical story about beef, and where the hometown newspaper openly acknowledges that "depending on the direction of the wind, there are some days when the smell of flatulent cattle hits you so hard you can almost taste it." A landlocked city surrounded by other towns that are home to beef ranches and feedlots, Amarillo is perhaps most famous for The Big Texan Steak Ranch, a steak and American food restaurant along Route 66 that has been open since the 1960's and advertises its “free” 72-oz steak for miles. In other words, Amarillo is not a good destination for eating sushi. Amarillo's downtown is mostly empty on a weeknight, save for a few guests checking in at the hotel lobby. One block down the road, a small group is taking advantage of a late night happy hour at the bar of Rain Premier Sushi Bar & Lounge, Amarillo's sushi restaurant. Everyone is cold. The heater is not working, a waitress explains. A bar menu offers variations of salmon that is cooked but presented in a way that resembles sushi, such as inside a roll of rice or atop a pile of fake crab. There are also chicken wings that they somehow figured out how to stuff with pork and noodles, probably by scooping out some of the original chicken meat to make room, a dish that tastes as appetizing as it sounds. Remember: this is a beef town, not a sushi town. Follow the touristy billboards advertising a "Free 72 oz. steak" for the better choice. 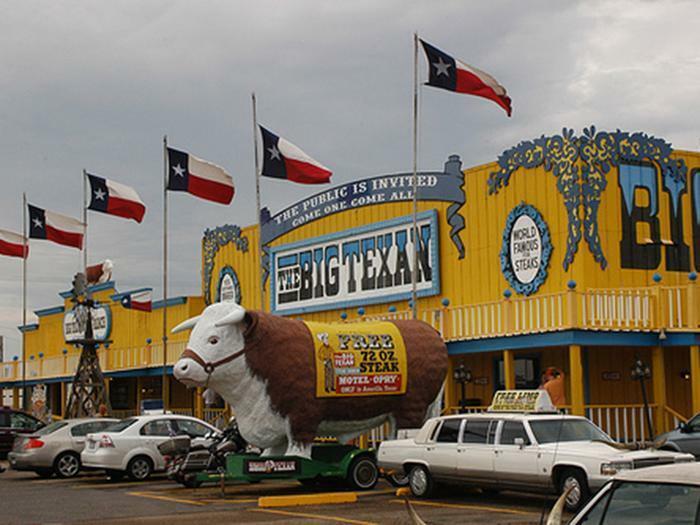 The Big Texan opens bright and early every morning at 7 a.m. and serves steak to the masses until 10:30 at night. It's less of a restaurant and more of an eating-focused Chuck E. Cheese: there is a selection of hunting arcade games, gourmet fudge on sale by the entrance, and a Zoltar Fortune Teller Machine that yells at people sitting at the bar thanks to a censor. A stage above the central dining area is where the free 72-oz. steak challenge takes place. The rules are as follows: participants must pay $72 upfront, then eat the entire steak plus appetizers while sitting on the stage below a giant timer. Only people who clean their plate will be refunded their money. 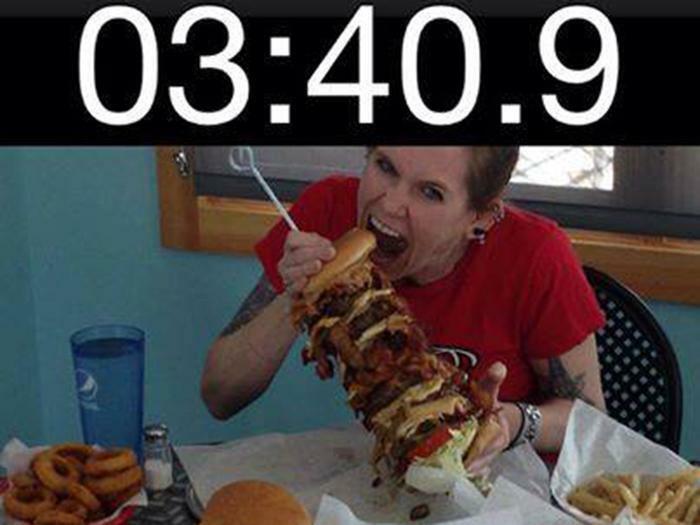 You eat in this section to watch the stage from the comfort of a regular table, as participating is something best left to professionals like Molly Schuyler, a 120-pound competitive eater who has broken numerous records and consumed the entire steak dinner in less than five minutes. But this main dining area can be crowded with tourists, loud, and sometimes the site of children's birthday parties. To enjoy a relatively quiet, normal steak dinner with locals and straightforward service, the better option is to eat your meal at The Big Texan's bar. You can order your steak anyway you want, from rare to well-done. Plenty of other American food is available on the menu, though it is best to focus on the steak and choose sides that complement it. 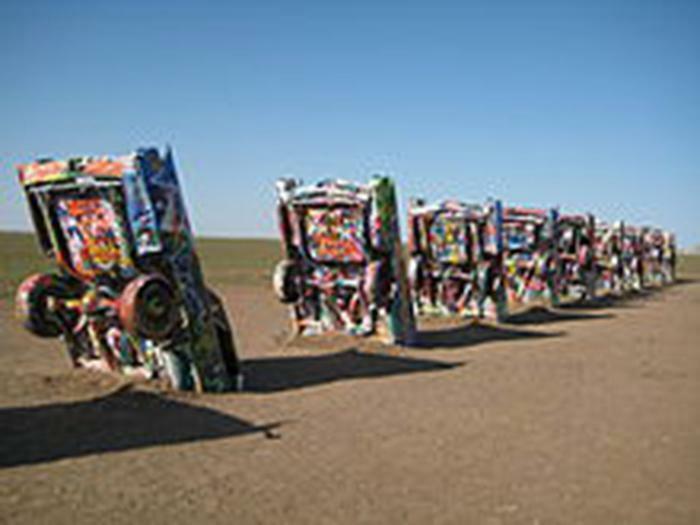 Before hitting the highway again, a good, not-beef-eating activity in Amarillo is to take a walk around Cadillac Ranch, the public art installation along Route 66 of ten cadillac vehicles standing in an empty field, covered in paint and graffiti. Anyone from the public is welcomed to deface the roadside attraction. Just don't forget when you’re painting on the Cadillacs outside that you're in beef country. As one TripAdvisor review warns: "The area smells like cows and there is no gift shop or attraction manager."